All things considered, it could have been worse, but it still represented a big challenge to yours truly. A layered cake? That is intimidating to say the least. I needed heavy artillery for it, so a trip to my America’s Test Kitchen source was needed. As you may know, they are notoriously difficult in allowing bloggers to publish their sacred recipes, but I found a very close adaptation to share with you. It comes from Leite’s Culinaria, a site that I’ve been following for a long time. Definitely worth subscribing to. Make the pecan filling: Whisk the yolks in a medium saucepan off the stove. Gradually whisk in the evaporated milk. Add the sugars, butter, and salt and cook over medium-high heat, whisking constantly, until the mixture is boiling, frothy, and slightly thickened, about 6 minutes. Pour the mixture into a bowl, whisk in the vanilla, then stir in the coconut. Let cool until room temperature. Heat the oven to 350°F (175°C). Toast the pecans on a rimmed baking sheet until fragrant and browned, about 8 minutes. Transfer to a plate to cool. 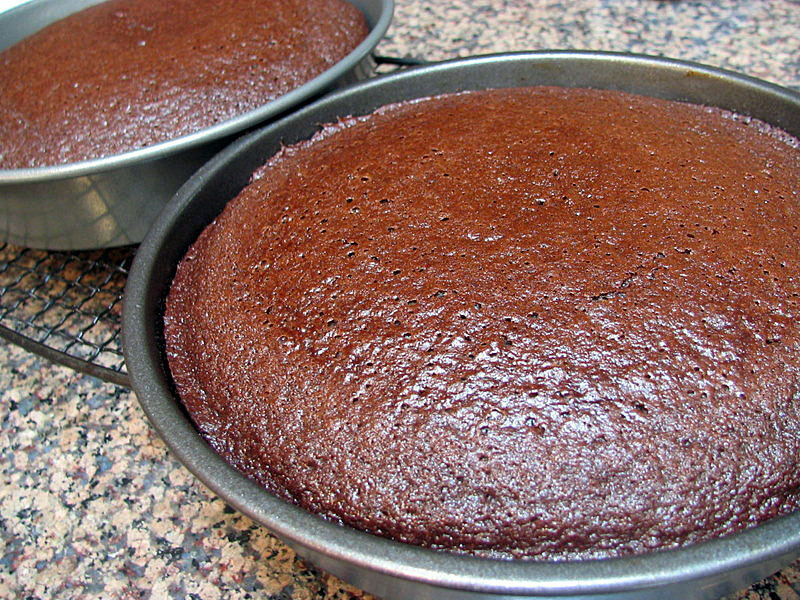 Make the chocolate cake: Keep your oven at 350°F (175°C) and adjust an oven rack to the lower-middle position. Combine the chocolate and cocoa in a small bowl and then add the boiling water over. Let stand to melt the chocolate, about 2 minutes. Whisk until smooth and let stand until room temperature. Spray two 9-inch-round by 2-inch-high straight-sided cake pans with nonstick cooking spray and then line the bottoms with parchment or waxed paper rounds cut to fit. Spray the paper rounds, dust the pans with flour, and tap out any excess flour. Sift the flour and baking soda into a medium bowl or onto a sheet of parchment or waxed paper. In the bowl of a standing mixer, beat the butter, sugars, and salt at medium-low speed until the sugar is moistened, about 30 seconds. Increase the speed to medium-high and beat until the mixture is light and fluffy, about 4 minutes, scraping down the bowl with a rubber spatula halfway through. With the mixer running at medium speed, add the eggs one at a time, beating well after each addition and scraping down the bowl halfway through. Beat in the vanilla, then increase the speed to medium-high and beat until light and fluffy, about 45 seconds. With the mixer running at low-speed, add the chocolate mixture, then increase the speed to medium and beat until combined, about 30 seconds, scraping down the bowl once. With the mixer running at low-speed, add the dry ingredients in 3 additions, alternating with the sour cream in 2 additions, beginning and ending with the dry ingredients. Beat in each addition until barely combined. After adding the final flour addition, beat on low until just combined, then stir the batter by hand with a rubber spatula, scraping the bottom and sides of the bowl. The batter will be thick. Divide the batter evenly between the prepared cake pans, spreading the batter to the edges of the pans with the rubber spatula and smoothing the surface. Bake the cakes until a toothpick inserted into the center of the cakes comes out clean, about 30 minutes. Cool in the pans 10 minutes, then invert the cakes onto a greased wire rack; peel off and discard the paper rounds. Cool the cakes to room temperature before filling, about 1 hour. 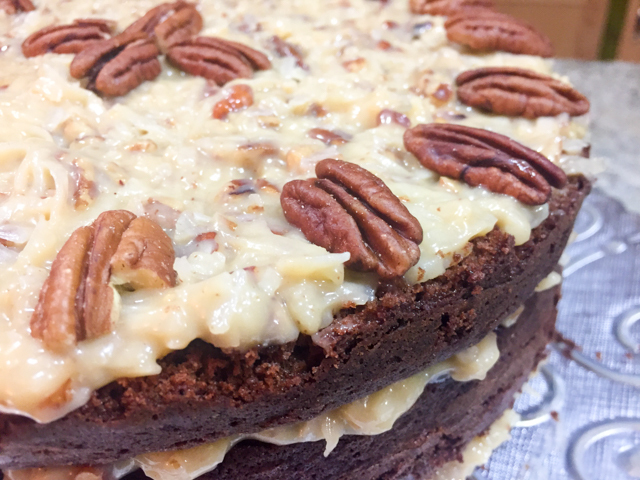 Assemble the German chocolate cake: Stir the toasted pecans into the chilled filling. Set one cake layer on a serving platter. Place the second cake on a work surface or leave it on the wire rack. Hold a serrated knife held so the blade is parallel with the work surface and use a sawing motion to cut each cake into 2 equal layers. Carefully lift the top layer off each cake. Using an icing spatula, distribute about 1 cup filling evenly on the cake layer on the serving platter or cardboard round, spreading the filling to the very edge of the cake and evening the surface. Carefully place the upper cake layer on top of the filling. Repeat using the remaining filling and cake layers. Dust any crumbs from the platter and serve. Comments: First things first, let’s clarify for those who do not know, that German Chocolate Cake has nothing to do with Germany. The name refers to Mr. Samuel German, an English-American chocolatier who developed the special formulation of baking chocolate used in the recipe. 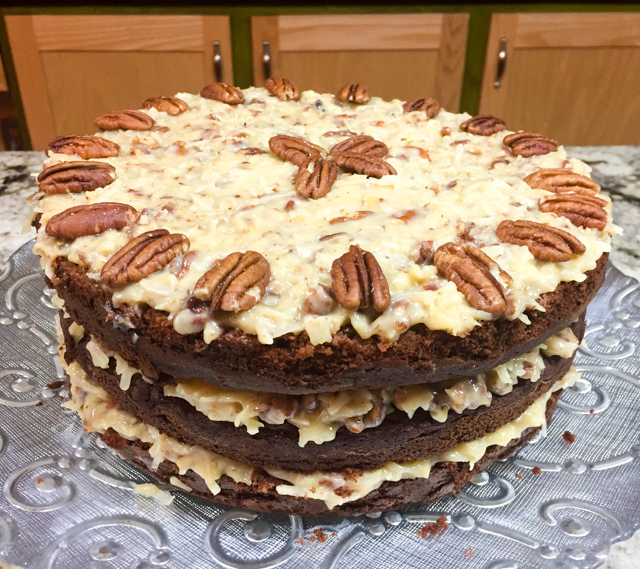 Having said that, it is a classic indeed: chocolate, coconut and pecans. There, I gained two pounds just typing the ingredients, but in the name of having My Precioussss repaired, I don’t mind it at all. 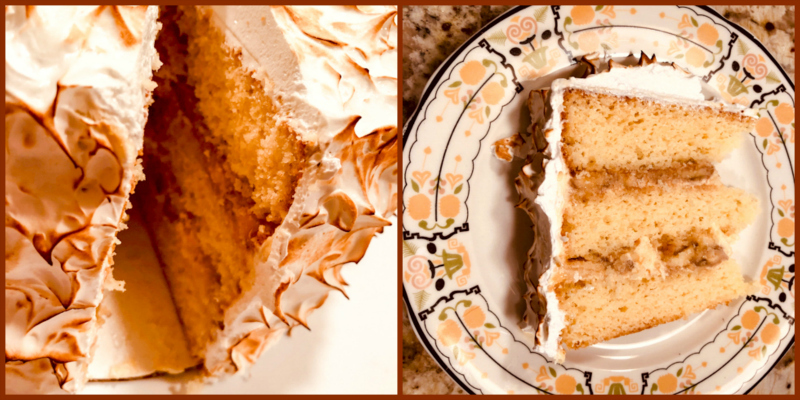 As I mentioned, I turned it into a three-layer cake instead of four, and trust me, you won’t miss the fourth one, it is already pretty rich and decadent. The cake is very moist, and the filling is perfect, if you like coconut, that is. Sweet, creamy, with a nice added texture given by the nuts and coconut. A winner, perfect celebration cake. So there you have it. A challenge proposed, accepted, and conquered. Not sure I want to set myself up for another one, so I hope our gamma-counter will be ok until my retirement… And yes, our IT man, the Performer of Miracles on All Things Electronic, was very pleased with the cake. ONE YEAR AGO: Thank you! One year of blogging! It passed with astonishing speed, proving that time flies when you’re having fun! It’s surely been fun, sharing what happens in our kitchen with friends, family and lots of other folks, and getting acquainted (at least virtually) with new people and bloggers through comments and emails. A cake is a mandatory birthday celebration! Unfortunately, cake and Sally don’t make a good match. But in the name of this special occasion I faced my demons and baked a cake. Choosing the recipe wasn’t easy, but I decided by elimination: genoise was out of the question, I’d rather be tortured. Any recipes involving the instructions “cream the butter with the sugar” were also excluded. Then, browsing the latest issue of Bon Appetit, I spotted a layered chocolate raspberry cake and I was smitten: that was it! 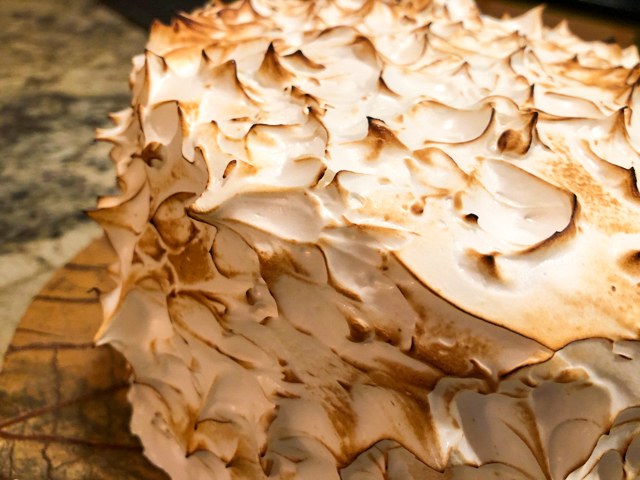 Luscious, beautiful, perfect… would you believe that the recipe didn’t need an electric mixer? 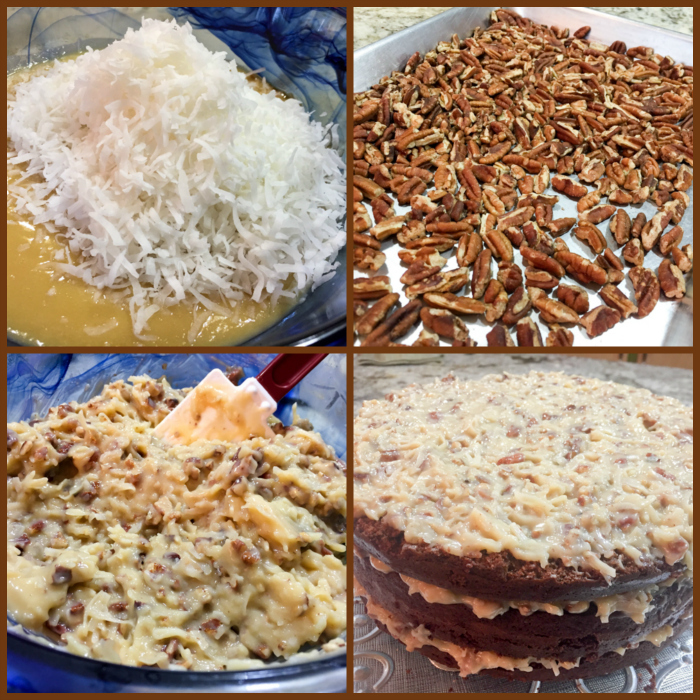 Instead, two bowls and a whisk…. my kind of recipe! Even the layering didn’t bother me (although it should have, … but ignorance is bliss). Heat the oven to 350°F. Coat two 9-inch-diameter cake pans with nonstick spray. Line their bottoms with parchment paper rounds and spray the rounds. Sift the flour, sugar, cocoa powder, baking soda, and salt into a large bowl; whisk to blend and form a well in the center. Whisk 1 cup of water, buttermilk, oil, and eggs in a medium bowl to blend. Pour the wet ingredients into well in dry ingredients; whisk just to blend. Divide the cake batter between the prepared pans. Bake the cakes for 30 minutes or until a toothpick inserted into center comes out clean. Cool completely in pans on cooling racks. Place the chopped chocolate in a medium bowl. Bring the cream to a boil in a heavy medium saucepan. Pour it over the chocolate. Let stand for 1 minute, then stir until the ganache is melted and smooth. Transfer 1 + 1/4 cups of the ganache to a small bowl. Cover and refrigerate until the ganache is thick enough to spread, stirring occasionally, about 1 hour. Let the remaining ganache stand at room temperature to cool until lukewarm. Invert one cake onto a cardboard round or the bottom of 9-inch-diameter tart pan. Peel off the parchment paper and spread 3 tablespoons of raspberry jam over the top, then spoon dollops of chilled ganache over the surface, spreading it around. Invert the second cake onto another cardboard round or tart pan bottom. Peel off its parchment paper. Carefully slide the cake off its round and onto the frosted cake layer. 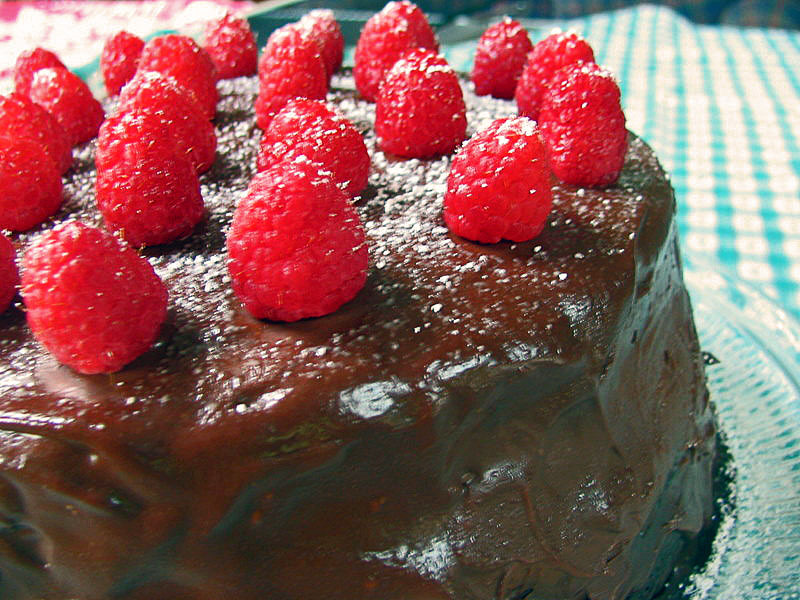 Spread the remaining 3 tablespoons of raspberry jam over top of the second cake layer, and pour half of the lukewarm ganache over the cake, spreading it over the sides to cover. Place the cake in the freezer until the ganache sets, about 30 minutes. 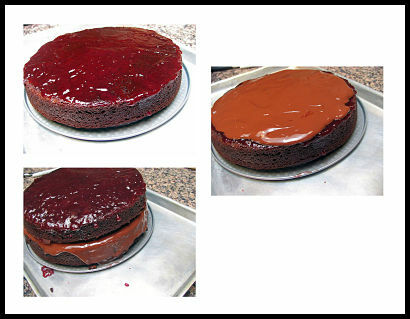 Pour the remaining ganache over the cake, allowing it to drip down sides and spreading over the sides if needed for even coverage and smooth edges. Freeze again to set the ganache, about 30 minutes. Arrange the raspberries in concentric circles atop the cake, then sift powdered sugar lightly over raspberries and serve. Comments: I wish that my cake-phobia was cured, but now I have a few more reasons to stick with breads and pizzas. 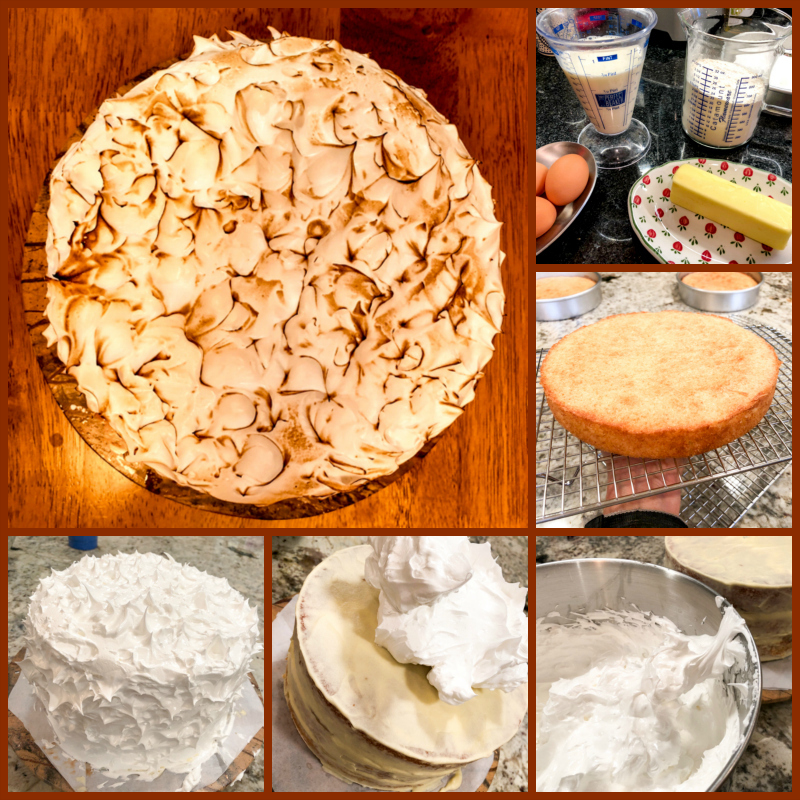 At first my confidence grew as the batter behaved exactly as anticipated, filling two 9-inch cake pans and baking into beautiful brown cakes with only a slight dome in the center. But the Cake Gods weren’t quite finished with their conspiracy against me. Spreading the ganache was nightmarish, to put it mildly. Thinking back, I realize that it wasn’t quite hard enough to spread, so instead of forming a nice thick layer, it ran down the sides, but my cake-naivete made me go on, thinking that eventually everything would be OK. When I placed the second cake on top of the first, once all the slippage-fiesta stopped, the ganache layer had a big gap all around the edges, that stubbornly resisted my attempts to fill it. In despair, I checked my cake pans, and was shocked and appalled to realize that they were not identical in size – a small difference from one brand of pan to another, which made my layers unequal. My last hope was that the “lukewarm icing” would solve all the problems and make a beautiful, smooth covering of all the boo-boos. But, this was not the case. Not a chance. To make a long story short, my cake ended a bit like the Leaning Tower of Pisa in Italy. Its sides had nothing to do with the “picture perfect” look in the magazine. 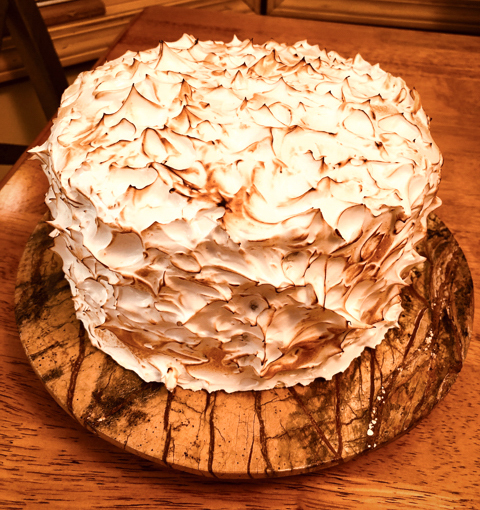 I had hoped to post a picture of my cake on a gorgeous stand with a nice candle in the center, but I settled instead for the only photo that showed more cake than boo-boos. One year ago…. Welcome to my blog!